"I am being asked by others in my company to start using WD40 as a bearing lubricant. I know that this is not best practice, but I need to explain to them why. Any advice?" To understand how WD40 might work as a lubricant, we need to first understand its chemical composition. On the WD40 Web site, the marketing pitch lists the ingredients as "secret," but the material safety data sheet (MSDS) indicates the following: 60 to 70 percent petroleum distillates, 15 to 25 percent base oil and 2 to 3 percent carbon dioxide. So it would appear that WD40 is simply a combination of petroleum products mixed with a propellant (CO2). First, the lubricant must have good oxidation resistance to resist sludge and varnish buildup at operating temperatures. While most lubricants are formulated with antioxidant additives to provide this protection, in addition to any natural protection afforded by the use of synthetic base stocks, it appears from the MSDS sheet that WD40 does not contain such additives and would likely degrade and form sludge fairly rapidly if used at even moderate operating temperatures. 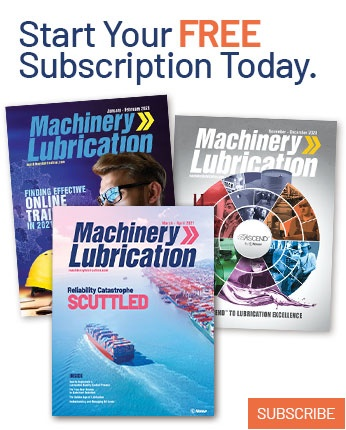 Second, you will hear it said that "viscosity is the single most important property when selecting a lubricant." This is particularly true for rolling element bearing lubrication. Viscosity selection is based on a number of factors, including bearing type (ball, cylindrical roller, etc. ), speed, bearing size, load and operating temperature. It is usually selected by calculating the bearing speed factor (dN) and the projected operating temperature. Standard charts are then available to select the viscosity given the dN factor and the temperature. While the exact viscosity of the petroleum distillates or base oil in WD40 is unknown, from experience it has been determined that it does not have a particularly high viscosity. 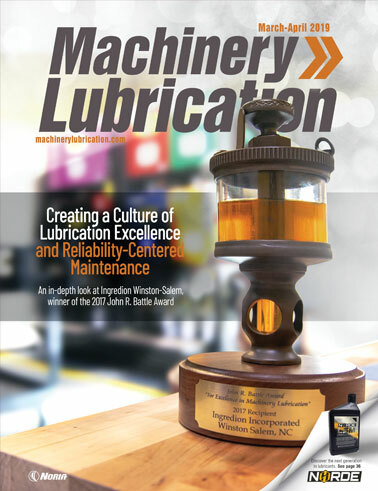 So unless this application is particularly high speed, operating at low to moderate temperatures, it is unlikely that WD40 contains an oil of sufficiently high viscosity to provide adequate lubrication for the rolling element/bearing raceway interface. One other factor to consider is that depending on bearing design, the roll/cage interface will also likely operate under hydrodynamic conditions. Under these conditions, the typical rule of thumb is for a minimum viscosity of 4 centistokes (at operating temperature) to support the load. Again, it is unlikely that WD40 would meet these requirements as a lubricant. Third, depending on the operating environment, the bearing will be prone to corrosion, particularly rusting. Nearly all lubricants contain specific additives called rust inhibitors to counteract this. Again, the MSDS sheet offers no evidence of such additives in WD40. Fourth, depending on bearing design and application, the use of anti-wear additives may be required, particularly where heavy or shock loads are present or where the application dictates possible thrust loading between the end of the rolling element and the raceway flanges. 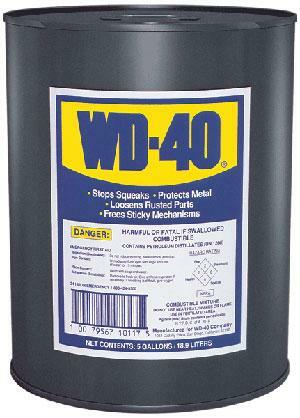 Based on the MSDS sheet, WD40 does not appear to contain such additives, which may result in fatigue and/or adhesive wear. Keep in mind that WD40 is manufactured and marketed as a household lubricant for those "small jobs" or as a rust remover. For these applications, it does a fine job. However, WD40 is not sold nor should it be used as a replacement for the appropriately selected lubricant for rolling element applications in the plant — unless of course we're talking about the fan in your computer.